Nutratech Trioxalin – Powerful Fat Burner and Appetite Suppressant and Weight Loss Aid for VLCD (Very Low Calorie) Diets. Nutratech's Trioxalin drops are designed to mimic the effects of the body's hormones that are responsible for burning fat and calories, and curbing appetite. While on a very low calorie diet, we tend to lose motivation, our thyroid slows down, and fat loss suffers. 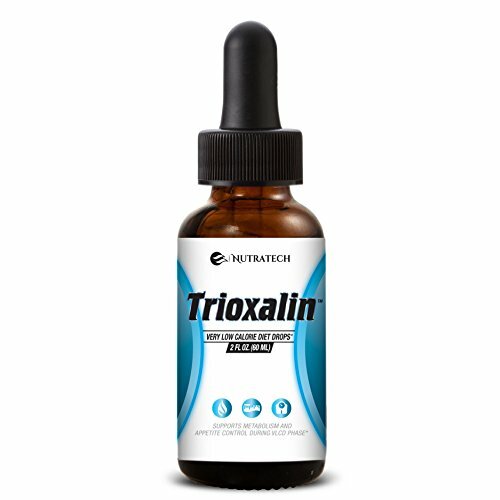 Trioxalin drops stop this process of demotivation and thyroid slowdown by providing the body with the amino acids it needs to provide the building blocks for increased energy and thermogenesis while dieting. Trioxalin Drops are an effective way to get the results you want without sacrificing lean muscle or body weakness. Slim down with less fatigue and hunger, and fewer cravings. Diminish that craving for sugar without feeling deprived or hungry and keep your hard earned muscle while losing fat! Clinical research and trials have shown that lowering your calorie intake is the largest part of the equation to losing weight. Trioxalin Drops will help you achieve your weight loss goals by providing your body with the nutrients, amino acids, and appetite suppressants it needs while on a highly restricted diet. We only offer dietary supplements made with the most natural, high-quality and effective ingredients on the market. Our sole purpose is to provide first-class products and 100% customer satisfaction. Trioxalin Drops come with a 30 day money back guarantee, so try it risk free! Very Low Calorie (VLC) drops are designed to help lose weight quickly by decreasing appetite, cutting cravings, and boosting metabolism. Depending on the diet and calories ingested, those using VLCD diet methods can see as much as ½ to 1 pound of fat loss PER DAY. Trioxalin Drops are to be used with the VLCD Diet, which typically incorporates anywhere from 500-1000 calories per day. It provides the necessary nutrients to curb hunger and keep the thyroid running while on a low calorie diet. Trioxalin is 100% all natural and does not have any side effects, nor does it have any stimulants. It is based on an amino acid profile that helps curb cravings and increase thermogenesis while on a highly restricted diet, of 500-1000 calories per day. High quality and made in the USA. Our products are designed and manufactured in a state of the art facility in the USA. Our products are made to the highest standards of FDA mandated Good Manufacturing Practices ("GMP") and we only source ingredients from FDA approved suppliers. 100% Satisfaction Guaranteed! Don't like it? Send it back. At Nutratech we understand that supplements have a different effect on different people, and we stand behind our best-in-class products with 30 day money back guarantee; if you don't like the product for any reason, send it back for a full refund at any time within 30 days of purchase. View More In Appetite Control & Suppressants. If you have any questions about this product by Trioxalin, contact us by completing and submitting the form below. If you are looking for a specif part number, please include it with your message.